The Battle of Cravant was fought on 31 July 1423, during the Hundred Years' War between English and French forces at the village of Cravant in Burgundy, at a bridge and ford on the banks of the river Yonne, a left-bank tributary of the Seine, southeast of Auxerre. The battle ended in a victory for the English and their Burgundian allies. After the Treaty of Troyes in 1420, the English king was permitted to occupy all the country north of the Loire. In 1422, with Henry V suddenly dead and an infant King Henry VI of England assuming the throne, hostilities resumed. In the early summer of 1423, the French Dauphin Charles assembled an army at Bourges intending to invade Burgundian territory. This French army contained a large number of Scots under John Stewart of Darnley, who was commanding the entire mixed force, as well as Spanish and Lombard mercenaries. This army besieged the town of Cravant. The garrison of Cravant requested help from the Dowager Duchess of Burgundy, who raised troops and in turn sought support from Burgundy's English allies, which was forthcoming. The two allied armies, one English, one Burgundian, rendezvoused at Auxerre on 29 July. The allied commanders held a council of war in Auxerre Cathedral on the evening of 29 July. This led to the drafting an order of battle, covering a mixture of tactical and disciplinary matters. The army was clearly intending to fight a dismounted action, with horses taken to the rear, and archers were to prepare anti-cavalry stakes. That night the army was ordered to pray for victory. The march was to begin at 10 o'clock the following morning. The combined English and Burgundian forces were led by Thomas Montacute, 4th Earl of Salisbury, with Lord Willoughby as second in command. The Anglo-Burgundian army mustered about 4,000 men, including 1500 men-at-arms (500 English and 1000 Burgundian), 2000 English archers, some Burgundian crossbowmen and pioneers and 40 veuglaires (light artillery), manned by the citizens of Auxerre. The French army was commanded by Sir John Stewart of Darnley with Louis, Count of Vendôme, as second in command. There were about 4,000 Scots. A sizeable French force was present with smaller forces of Aragonese and Lombard mercenaries. The Dauphinist army was larger than the Anglo-Burgundian force perhaps by two to three times. The allied army marched throughout 30 July and that evening, 6 kilometres (4 mi) short of Cravant, sighted the enemy. The following day, having assessed the enemy position as too strong, they crossed the river Yonne and attempted to reach Cravant by another route. Approaching the town from across the river, the allies saw that the French army had changed position and was now waiting for them on the other bank. For three hours the forces watched each other, neither willing to attempt an opposed river crossing. Eventually, the Scots archers began shooting into the allied ranks. The allied artillery replied, supported by their own archers and crossbowmen. Seeing the Dauphinists were suffering casualties and becoming disordered, Salisbury took the initiative and his army began to cross the waist-high river, some 50 metres wide, under a covering barrage of arrows from the English archers. Meanwhile, another force under Willoughby attacked the Scots across the narrow bridge and divided the Dauphin's army. The French began to withdraw, but the Scots refused to flee and fought on, to be cut down by the hundreds. Perhaps 1,200–3,000 of them fell at the bridgehead or along the riverbanks, and over 2,000 prisoners were taken, including Darnley (who also lost an eye) and the Comte de Vendôme. The Dauphin's forces retreated to the Loire. On 2 August, the English and Burgundian armies withdrew separately from Cravant, the Burgundians marching to Dijon, the English to Montaiguillon. The success at Cravant was the first for a joint English and Burgundian army. Despite this success, the allies would rarely fight together again, usually operating separately from one another. The Dauphinists would suffer an even greater defeat the following year at the Battle of Verneuil. ^ a b Myers 1996, p. 231. ^ Wagner 2006, p. 105. Burne, A.H. (1991) . The Agincourt War. London: Greenhill Books. p. 81. ISBN 1853670871. Myers, A.R., ed. (1996). English Historical Documents: Volume 4 1327-1485. London: Routledge. ISBN 978-0415143691. Smith, Robert; Kelly DeVries (2005). 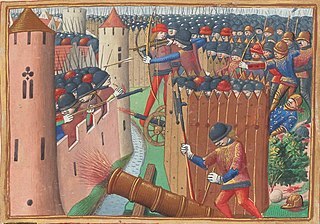 The Artillery of the Dukes of Burgundy 1363 – 1477. Woodbridge, Suffolk: Boydell & Brewer. pp. 150–1. ISBN 1843831627. The Siege of Orléans was the watershed of the Hundred Years' War between France and England. It was the French royal army's first major military victory to follow the crushing defeat at the Battle of Agincourt in 1415, and also the first while Joan of Arc was with the army. The siege took place at the pinnacle of English power during the later stages of the war. The city held strategic and symbolic significance to both sides of the conflict. The consensus among contemporaries was that the English regent, John of Lancaster, would have succeeded in realizing his brother the English king Henry V's dream of conquering all of France if Orléans fell. For half a year the English and their French allies appeared to be winning but the siege collapsed nine days after Joan's arrival. The Battle of Oudenarde was a battle in the War of the Spanish Succession fought on 11 July 1708 between the forces of Great Britain, the Dutch Republic and the Holy Roman Empire on the one side and those of France on the other. It took place at Oudenaarde and was a great victory for the allies. John the Fearless was Duke of Burgundy as John I from 1404 until his death. A scion of the royal house of France, he played an important role in French affairs during the early 15th century, in particular the struggles to rule the country for the mentally ill King Charles VI and the Hundred Years' War with England. His rash, unscrupulous, and violent political dealings contributed to the eruption of the Armagnac–Burgundian Civil War in France, and culminated in his assassination in 1419. John II of Luxembourg, Count of Ligny was a French nobleman and soldier, a younger son of John of Luxembourg, Lord of Beauvoir, and Marguerite of Enghien. His older brother Peter received his mother's fiefs, including the County of Brienne, while John received Beaurevoir. He married Jeanne de Béthune, Viscountess of Meaux, widow of Robert of Bar, on 23 November 1418, and became step-father to Jeanne de Bar, Countess of Marle and Soissons. He and Jeanne de Béthune had no children. The Siege of Compiègne (1430) was Joan of Arc's final military action. Her career as a leader ended with her capture by the Burgundians during a skirmish outside the town on 23 May 1430. Although this was otherwise a minor siege, both politically and militarily, the loss of France's most charismatic and successful commander was an important event of the Hundred Years' War. John Stewart, Earl of Buchan was a Scottish nobleman and soldier who fought alongside Scotland's French allies during the Hundred Years War. In 1419 he was sent to France by his father the Duke of Albany, Regent of Scotland, with an army of 6,000 men. Stewart led the combined Franco-Scottish army at the Battle of Baugé on 21 March 1421, where he comprehensively defeated the English forces, proving that the English could at last be beaten. However, two years later, Stewart was defeated and captured by Thomas Montacute, 4th Earl of Salisbury at the Battle of Cravant in 1423. After the battle he was exchanged, and after his release in 1424 he was appointed Constable of France making him the effective Commander-in-Chief of the French army. On 17 August 1424 Buchan was killed at the disastrous Battle of Verneuil, along with most of the Scottish troops in France. Sir John Stewart of Darnley, 1st Lord of Concressault and 1st Lord of Aubigny, Count of Évreux was a Scottish nobleman and prominent soldier during the Hundred Years War. The Battle of Montenaken was fought between the forces of Liège and the Duchy of Burgundy on 20 October 1465 as part of the First Liège War. Although outnumbered, the Burgundian force succeeded in routing the militia of Liège, inflicting heavy casualties. The Siege of Oudenaarde took place in 1452. It was one of the major engagements in the Revolt of Ghent (1449–53). The city was besieged by forces of the rebellious city of Ghent and defended by forces led by Simon de Lalaing, one of the leading captains of Philip the Good, Duke of Burgundy. The siege included one of the largest artillery bombardments then seen in Europe. The relief of the town by forces under Philip and his allies opened the way for an attack on Ghent by the Burgundian forces. In 1453 the rebels were defeated at the Battle of Gavere.